Whether you’re young or old chances are that you know at least one person who loves Lego building and what better excuse to grab out the bricks than Halloween! Plus it’s a fab way to entertain your little ones this half term. Even if you’re not a fan of the holiday these great little Lego building tutorials from the folks at LEGOLAND Discovery Manchester are sure to inspire you with a pumpkin and ghost! Comments Off on Spooky Halloween Lego! We enjoyed some marvellous weather over the weekend, to say the sun has been shy this year would be an understatement and it’s arrival was more than welcome. We celebrated with a day out in our garden, it felt almost tropical being able to sit outside and eat lunch without wearing a coat. In this country you have to take advantage of the good weather when it arrives, you never know when you’ll see it again! 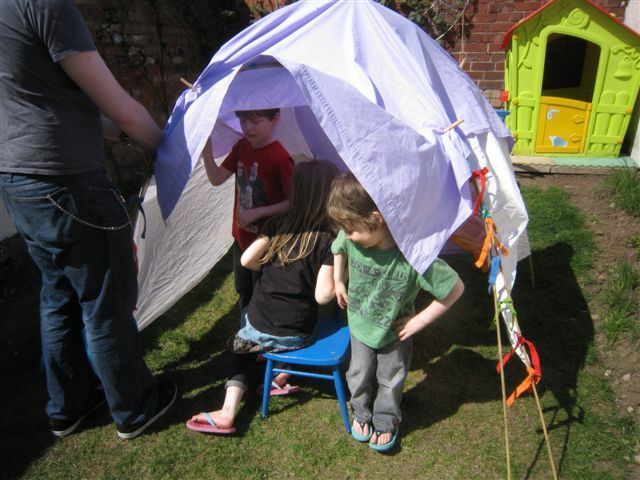 Earlier in the week I had promised to build a den with my children, originally I was envisioning sheets over tables and chairs, but the sun prompted us to we move our den building outside. My husband had a bag of unused garden canes which he bound together with garden twine. These were bent over to make dome shapes and bound together at the top. 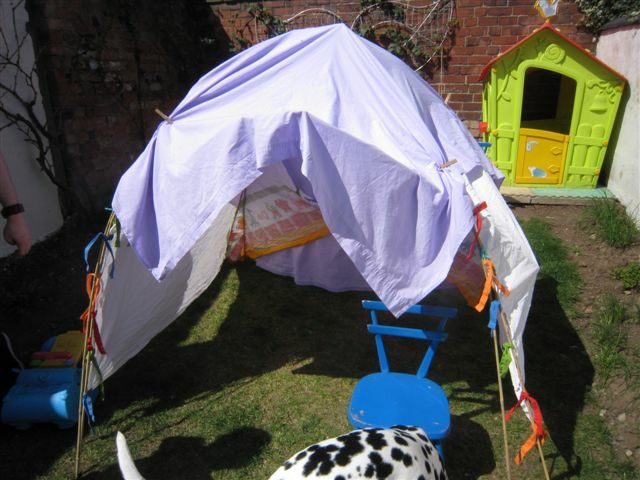 Then we used a pair of old curtains for the sides and a sheet for the top and ta-da a wonderful outdoor den. The kids all loved it, the adults did too! It might not be as elegant as a shop bought tee-pee but hey it’s free!! The best part is we can rebuild it whenever the sun decides to saw it’s face again 🙂 and it takes up zero storage space!